In 1953, Inge Edler was in charge of the Cardiology Department at the University Hospital, Lund, Sweden and was in the position responsible for the preoperative diagnosis of heart disease. At that time, cardiac catheterization and contrast x-rays of the heart failed to give enough data for a correct appraisal of the status of the mitral valve. Since a correct diagnosis is of great importance before an operation, Edler felt strongly that the inadequacy of the existing methods. This concern caused him to look for a new non-invasive alternative which he thought might resemble some kind of a radar. At the same time Carl Hellmuth Hertz, the son of the famed Nobel Laureate Gustav Hertz, was working as a graduate student at the nuclear physics department of the University of Lund. Because of this interest, he also studied ultrasound. He was acquainted with the ultrasonic reflectoscope developed for nondestructive materials testing. An ultrasonic reflectoscope was borrowed from the Tekniska Rontgencentralen, a company in the nearby town of Malmo, which specialized in nondestructive testing. With the equipment, they were able to obtained well-defined echoes on the CRT screen moving synchronously with his heart beat. Since Hertz's father had been the director of the Siemens Research Laboratory before the end of the war, they were able to contact director Wolfgnag Gellinek of the Siemens Medical Branch in Erlangen, Germany, to borrow one of their Siemens reflectoscopes. Elder and Hertz received the reflectoscope in October 1953 and set to work on it immediately. 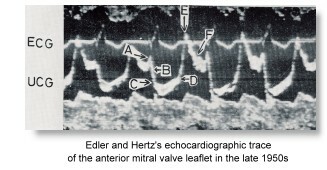 Edler finally established the characteristic motion pattern for the anterior leaflet of the mitral valve. He compared the shape of the fast moving echoes in patients with enlarged hearts due to mitral stenosis during cardiac operations, and found empirically the shape correlated well with the severity of the stenosis. By early 1955, Edler had so much evidence of this relationship that he relied on ultrasound alone for the diagnosis of mitral stenosis. The typical motion patterns of other heart valves, pericarditis, tumors, and thrombosis in the left atrium showed up in their recordings and were identified by close cooperation with Dr. Olle Dahlback's heart surgery group. The advent of a barium titanate transducer produced by Siemens in Germany in 1958 was an important advance for the group and had enabled them to study not only the normal mitral valve but also many other heart structures. 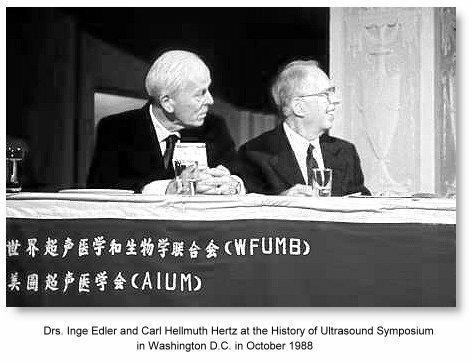 Apart from collaborating with Edler, Hertz had played a pivotal role of adviser and inspiration to all scientists in Lund, working in different fields of medical diagnostic ultrasound. Other pioneering groups and accomplishments in diagnostic ultrasound at the Lund University included the later team of Edler, Gustafson, Karlefors and Christensson; the first two-dimensional real-time cardiac images by Hertz and Asberg in 1967; the first simultaneous M-mode and intracardiac Doppler blood flow recordings by Edler and Lindstrom in 1971; early paediatric echocardiography by Lundstrom in 1971; early echoencephalography by Leksell in 1956 (see below) and the later clinical evaluation of Jeppsson and Lithander, the first academic dissertation on the diagnostic use of ultrasound in obstetrics by Sunden in 1964 (see below), and the work of Karel Marsal on fetal breathing and blood flow. Edler's valuable work has been recognized internationally. He was voted Sweden's most important cardiologist of the 20th century. In 1977, Edler and Hertz were jointly awarded the Lasker Award. This is an award that was established in 1946 by Albert and Mary Lasker to honor persons who have made significant contributions in basic and clinical research. It is one of the most important awards in the world that recognizes scientific accomplishment. Edler was cited for pioneering the clinical application of ultrasound for the medical diagnosis of abnormalities of the heart. Hertz was cited for pioneering the development of ultrasound technology in medicine. Many awardees go on to win the Nobel Prize. While Edler and Hertz were not fortunate enough to do so, many felt that this was a major oversight by the Nobel awards committee. At that time Professor Lars Leksell head of the department of neurosurgery at Lund, had made serious efforts to find a new tool for diagnosing subdural hematoma caused by a blow against the head. In 1950 he borrow a Kelvin-Hughes Mark 2B flaw-detector. Experience with this instrument agreed with similar futile efforts by Turner at the Royal Cancer Hospital in Marsden, England. Leksell soon returned the Mark 2B reflectoscope. He borrowed Elder's Siemens reflectoscope and was able to detect a clear displacement of the midline echo. He continued his investigations with a Kelvin Hughes Mark 4 instrument, and 1957 switched to a single transducer Krautkramer USIP 9. Akf Sjovall, then professor of obstetrics and gynecology, agreed with Leksell and Elder in 1957 (over the lunch table) that the usefulness of the echo method in early pregnancy should be investigated. He therefore encouraged one of his younger colleagues, Bertil Sunden, to investigate a number of pregnancies with the Krautkramer echoscope. Professor Ian Donald's description of an echoscope generating a two-dimensional display in 1958 immediately stimulated Sjovall's interest. He sent Bertil Sunden on a three-week visit to Donald and the Smith Industrial Division in Glasgow. 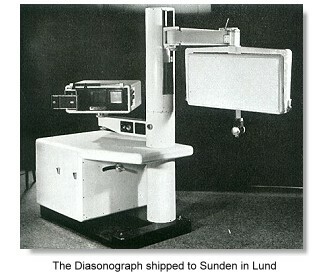 His work at Donald's department had resulted in the shipment of the second generation Diasonograph® to Lund, with which he produced his doctoral thesis on the use of ultrasound in Obstetrics and Gynecology, and reported his experience on 400 cases of pelvic pathologies. His papers although less well know than those of Donalds actually furnished some very important findings and images in the early development of pelvic and Obstetric ultrasonography. Sunden also studied the possible harmful effects of ultrasound on pregnant rats, and did not find any. Sunden's thesis was published in an English translation in the Acta Obstetrica et Gynecologica Scandinavica as a 180 pages supplement in 1964. This constituted as the earliest "textbook" on ultrasonography in Obstetrics and Gynecology, covering equipment, examination techniques, biological effects and A-scan and B-scan images. "..... Then came Dr. Bertil Sunden from Sweden as our first disciple from abroad. He was with us a month and we became great friends. I taught him all I knew and his subsequent career in Sweden has more than vindicated the time he spent with us. Some years later it was my great privilege to go to Sweden to examine him for his Docent, the equivalent of an M.D., in a public hall, in full evening dress, starting on a Saturday morning at 9.30 and finishing shortly before 2 pm. It was almost as much of an ordeal for me as it was for him. The proceedings were open to the Swedish public at large, who came and went throughout the morning as the spirit, or their viscera moved them. All the proceedings of this incredible examination were conducted in English and needless to say Dr. Sunden was awarded his degree by the University of Lund with a great flourish ..... ."
Carl Hellmuth Hertz became founding professor of the Department of Electrical Measurements, Lund Institute of Technology at Lund University. Hellmuth Hertz received several prizes from the Westrupska prize in 1963 for his work in biophysiology of plants to the Lasker prize for medical ultrasound in 1977 together with Inge Edler. There were many other prizes and accolades that followed. The activities in the field of ultrasound created a demand for some kind of printer suitable for the printing of colour pictures. This brought the beginning of a new activity. Hertz invented ink jet printing, a method for the electrical control of tiny droplets, which enabled him to put a dot of ink on a piece of paper in about one-millionth of a second. The pixel size was 0.1 x 0.1 mm with continously variable color saturation in each pixel. The first steps in ink jet printing were taken during the sixties. The common mingograph - a multi-channel ink jet printer - designed by Elmquist and in common use at hospitals for registration of ECG came to serve as the basic instrument on which the first experiments were made. The original goal was that the ink-jet plotter would replace the conventional film for printout of medical images, such as x-rays, CT and ultrasound images, for use in the future "digital" hospital! Image courtesy of Dr. Eric Blackwell, reproduced with permission.